Amy Adams and Matthew Goode play the cliched mis-matched personalities falling in love through adversity, and mostly get away with it because the scenery is breath-taking — the music’s pretty good, too. Yes, his accent is a bit weird to an Irishman (everyone non-Irish I know seems to think it’s great, and I’ll grant you it is pretty decent, but to an Irish ear it’s just oddly placeless and patchy: an amalgam of different parts of the country); yes, her character is way too tightly wound; and, yes, the cliches are piled upon cliches, but just get past that and enjoy it for the cute, undemanding flick that it is. She’s an up-tight romantic from Boston, he’s a cynical bar owner from Kerry. Who says opposites don’t attract? For me, the thing about any movie set in Ireland is I can’t stop thinking about where everything was filmed. Sometimes, I know the places like the back of my hand, and other times it takes forever to work out where something was shot. So after lot of internet searching, repeated viewings, and one coincidental visit on our trip home last year, I can present this short roundup of most of the main locations. The supposed Dingle peninsula is really nowhere near Dingle, Co. Kerry. Declan’s pub is in the village of Kilmurvy on Inis Mór (or at least the exterior is, I suspect the interiors were shot in a studio somewhere). The final proposal scene takes place just outside the walls of Dun Aengus, which is a few hundred yards from the village (and is one of the most-recognizable Irish sites in the country — what were the filmmakers thinking?). When they get into the “classic” Renault 4 the next morning you briefly see a fake ogham stone beside one of the souvenir shops. I knew exactly where they were when I noticed that detail. Kilmurvy is the village at the foot of Dun Aengus where the tour buses drop you off, and while we were browsing in the tourist shops waiting for the bus to return I went over to check out the “ogham stone.” Up close, you can tell the lines were cut by machine. Like the filmmakers, somebody in the village was trying just a little too hard to make everything look authentic. At least Inis Mór is dramatic, and windswept, and just gorgeous — but then, so is the real Dingle peninsula. Incidentally, the village of Kilmurvy is one of the few (very few, I only need one hand to count them–and there are fingers left over) places where you can get a good latte in the whole of Ireland. The cafe/restaurant where this miracle occurred is the building on the right in that shot of Anna tottering up the road from the beach. The other thing to be said for Kilmurvy is that they don’t gouge tourists in the shops. My camera batteries ran out while we were at Dun Aengus and I bought new ones in one of the tourist stores, full well thinking I was paying over the odds. When were were back on the mainland a couple of days later I checked the price of batteries in a supermarket, and noticed the island store had charged about the same. Sure, they’re daecent folk on Inis Mór (as Declan might say in his Oirish accent). I’m sorry, their “Ballycarbery Castle” is not real! The “Ballycarbery Castle” seen in Leap Year is really a combo of the Rock of Dunamase and some CGI. The Rock, which is in Co. Laois, not Co. Tipperary) is a nice spot to visit, although the view from the top of the ruins isn’t really the view that was seen in the movie (a little more CGI magic). Generally speaking, the arch they walk under and the walls right beside them appear to be real, and the lofty towers seen in the distance and the one they “climb” to the top of are fake. Dunamase isn’t really that high and steep, but it is a brilliant picnicing spot on sunny summer weekends. As Irish ruins go, this one is a little different because it was blown up by Cromwell’s forces in order to prevent the Irish using it against them. So you come across the odd sight of several thick hunks of wall lying on their side, instead of the usual decaying ramparts and gentle piles of rubble like at most ruined castles. 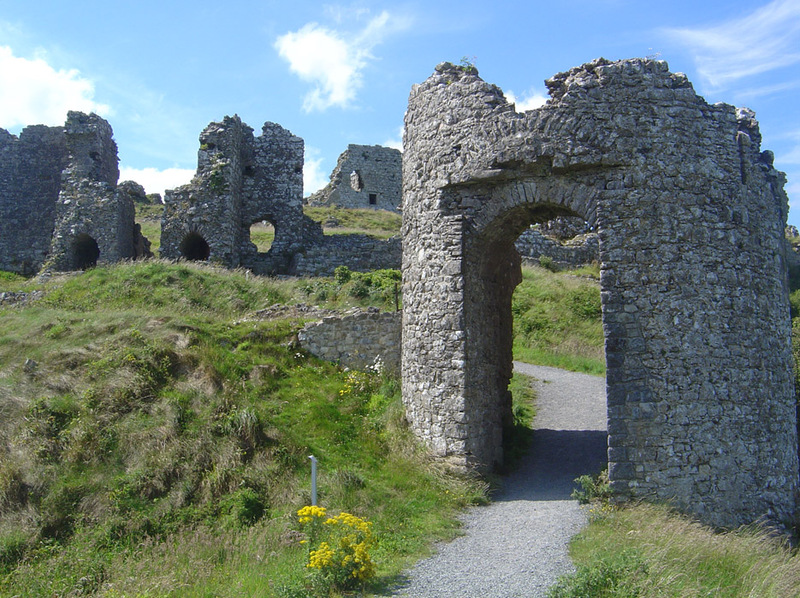 Just to add a little confusion, there is a Ballycarbery Castle on the Co. Kerry coast. However, it was not used in this film. It is ruined, but a fun place to explore if you’re in the area. The wedding was shot at the upper lake at Glendalough, which is not so far from Enniskerry, where internet rumor has it the post-wedding waiting-for-the-bus scene was shot. After that, the gorgeous park they walk through in Dublin is part of St. Stephen’s Green. They must have got a very nice day for the filming, because I’ve been there many times and can’t remember it looking so well. When useless cardiologist boyfriend finally gets around to proposing, the “Dublin” hotel lobby they’re standing in is predictably not in Dublin at all. The scenes were filmed at the Carton House Hotel in Maynooth, Co. Kildare, which enjoys the great advantages of being not too far from Dublin, surrounded by nicer scenery, and being in an area with far less traffic congestion. There are probably other places worth pointing out and identifying, but those are places I didn’t recognize, places I haven’t been to yet. Hopefully I’ll be driving along some road in Connemara next year and will suddenly recognize a stretch of coastline, a windswept pub, or chattering stream from Leap Year, or some other Irish movie. Maybe it’ll be a scene from The Quiet Man, The War of the Buttons, Into the West, or some other film I’ve seen too many times, yet never seem to get sick of. We’ve launched a free email newsletter! Hi Rich. Really liked this entry. I get a lot of flack for loving this movie, but I know it is “cheesey” and like it anyway. Maybe I can go visit some of those places when I go? Will have to watch this “fillum” again and pay more attention to the scenery. Yes, make Stephen take you over to Aran Mor at the very least (or did you do that last time?). I will be taking the girls for a trip to Kildare & the Rock of Dunamase at some point, so maybe we can plan it while we overlap — the more the merrier. If we have a sunny Sunday it would be awesome. BTW, it really is fill-um. In Gaelic a lot of the consonants act as and are sounded as syllables in certain combinations, so people who grew up speaking Irish naturally apply the same rules to English. Hence an elm becomes el-em, Colm is Col-um, and film is fill-um. I’m not a linguist, but somebody explained it to me one time, and I may be grossy over-simplifying the matter. Interesting about the language! Yes—all those places sound great. I have not seen any of them yet. Thanks. Hello, I am wondering if you can offer some advice. I am planning a trip to Ireland in November (2012). I use the word planning loosely because I’ve not gotten very far. This will be a solo trip, and although I don’t mind visiting several places I would prefer to stay in one place, such as a large hotel/resort or other place with nice accommodations (money is no object within reason). I am lost as to what areas of Ireland would be the best in terms of scenery. I hate to pull from sterotypes, but I would love to find something either in or very close to the countryside but also be near cliffs/water/or ocean. I know this is a tall order but any suggestions would be so appreciated! I have looked quite a bit on the Internet but its quite difficult to wrap your head around a whole country. By the way, this will be approximately a 10 night trip, so I am not adverse to spending 5 nights in one location and another 5 nights in another location. I need to look into what is required for car rentals in Ireland. I will be coming from America. Thank you for any help! The post-wedding bench scene is definitely Enniskerry, an absolutely beautiful village. I was renting about 3 miles away when I watched the film. The benches are around the large monolith in the village square, opposite the Powercourt Arms. BTW our whole family loved the film and have watched it many times. Declan’s accent sounds similar to friends accents from Cork. Just my opinion. You do know he an English actor? Matthew Goode? Yes, he’s English. A pretty good actor from what I’ve seen. Yes, I’ve found that I’m a lot less picky about watching films set in Ireland since I left. The nostalgia factor usually compensates for the awful accents and cliched stories. One day, I might even have the stomach to watch Far & Away…. Don’t do it! I live in Mayo and when I go to Dublin – well, the accent is so very different and I have a terrible uncontrolled problem of mimicking accents. Last time I got drunk in Dublin I was told I sounded like Tom in Far and Away – it broke my heart. I’m a bit of a parrot myself, which means I now sounds American unless I’m on the phone with my Da. (Been here 19 years, now…) Never been accused of sounding like Tom, though. Sure that put you off the beer for a month. It sure put me off Dublin! Where are you now? North Carolina, up in the mountains. Very Irish weather up here lately, lots of rain. Scenery isn’t very much like home though. Been very often. Grandmom born in Galway. My heart is there. Just returned 2 months ago. It was so cold. better to go in July or Aug even it the rates are higher. Love the movie, watch it all the time. My son is going to do photos of the Castles. He wants me to go. I Te you. You killed it. Thanks. On the other hand, I do thank you.. too. My boyfriend, who died last November, was an extra in the film. They filmed him walking in “Boston” but it actually was “Boston” projected on a blue screen or green screen in Dublin. I thought their Boston was really odd looking before he told me that. Nevertheless, I want to get the film just to see him in it for a few seconds. Fascinating, and yes, it does look like stock footage in the background. Sorry to hear about your boyfriend. Hope it helps to have his moment in the the film.